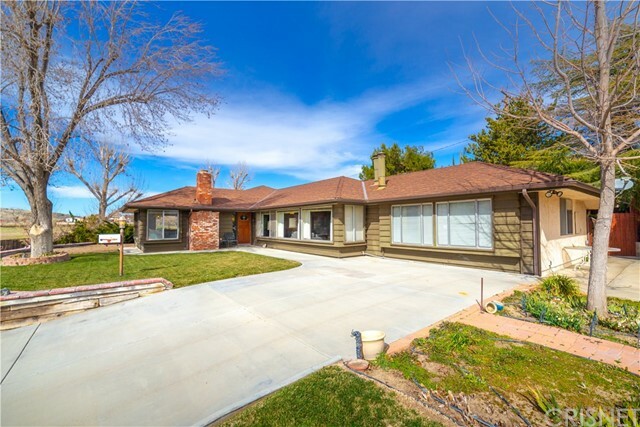 All Leona Valley homes currently listed for sale in Leona Valley as of 04/21/2019 are shown below. You can change the search criteria at any time by pressing the 'Change Search' button below. If you have any questions or you would like more information about any Leona Valley homes for sale or other Leona Valley real estate, please contact us and one of our knowledgeable Leona Valley REALTORS® would be pleased to assist you. "Magnificently Crafted And Designed Tuscan Custom Built Estate. With All The Finest Finishes Imported, This Quality Crafted Masterpiece Is One Of The City's Best Kept Secrets. Perched On A 5 Acre Lot, The Property Sits At Top For Breathtaking Sunrises/ Sunsets & Complete Privacy. The Grandeur Gourmet Kitchen Is Truly A Chef's Dream. It Is Complimented With A Convection Oven That Has A 6-Burner Range, A HUGE Island, Custom Granite Countertops, 2 Sinks, Plenty Of Cherry Cabinetry w/ Soft Close Draw"
"Welcome to 39954 90th street in the beautiful and breathtaking leona valley. This is a two in one sale as there are two properties included in this sale. One of which features the home, pool and horse accommodations and the back lot is vacant. The interior of the home has been delightfully updated with a rustic taste. The kitchen has granite counter tops with a large center island. recessed lighting and butcher door into the living room. All guest bedrooms are downstairs and the master suite is "
"Leona Valley Living at it's Best! The Care and Love of this Home is Evident from the Moment You Drive Through the Gate. This Meticulously Landscaped Home Sits on Two Lots Featuring Over 12.50 Acres and Includes it's Own Well, an Extra Detached 600 sqft. 2 Car Garage, an Additional 1,646 sqft 2 Story Workshop, a 56x14 Tractor Shed, & 4 Car/Boat Barns. 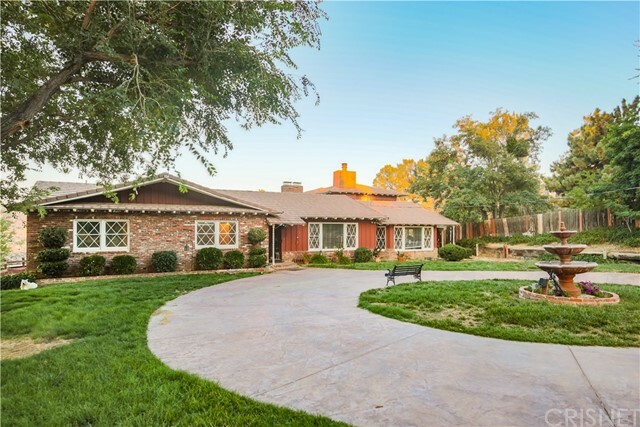 As You Enter the Front Door, You are Welcomed by a Cozy Formal Living Room, Open Floor Plan, & a Spacious Family Room that Opens to the Remodeled K"
"Private gated contemporary mid-century modern home on 11 plus acres in Leona Valley! Breathtaking panoramic views! Owned solar! Walls of glass provide lots of natural light and views throughout. Open living room and dining area with fireplace and wood floors. Upgraded kitchen has granite counters, custom tile backsplash, stainless steel appliances, commercial GE Monogram refrigerator, wine fridge, two walk in pantries, lots of cabinet space and built ins with lights, breakfast bar and eat-in kit"
"Welcome To Idle Hour Ranch. 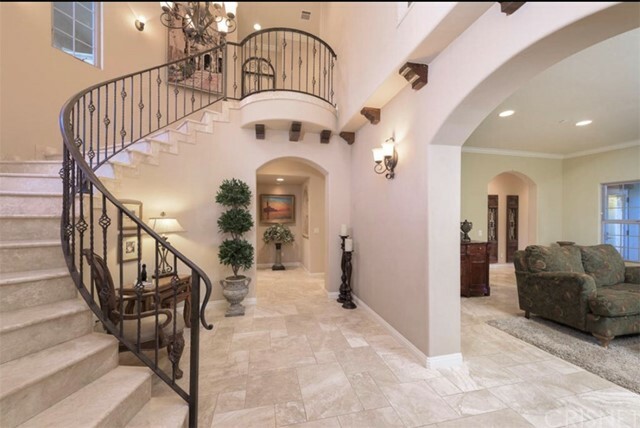 This home is one of the most luxurious estates in Leona Valley. 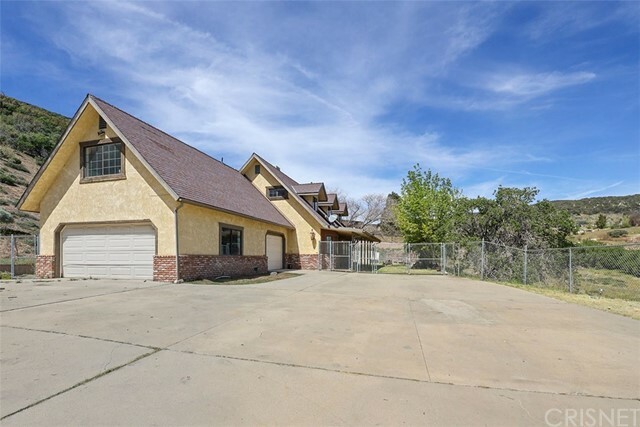 Situated on a secluded 11.08 acre lot w/ 360 degree mountain views. 4 large bedrooms, 4 bathrooms, & approx. 4k sq. ft.+ tons of upgrades in the home. Each room has it's own electrical radiant heating system. Downstairs family room w/ fireplace, wet bar, & wine cellar that holds 820 bottles. Downstairs suite w/ ceiling fan & connecting bath. Living room w/ 2'nd fireplace, surround sound, & french doors le"
"Lovely Leona Valley Home on 15ac! View VIDEO TOUR. 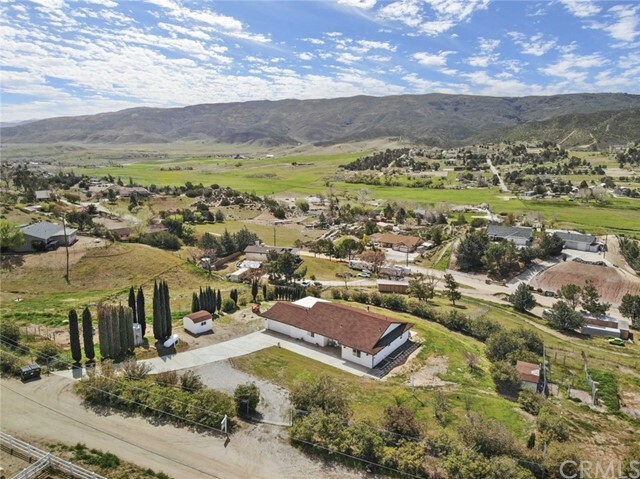 Private, gorgeous views yet minutes to Palmdale & Quartz Hill. Custom home with 3 bedrooms plus an office/bonus room, 3 baths. Rich wood work including open beam ceilings. Formal living & dining plus family room with cozy floor to ceiling brick fireplace. Great kitchen with center island, lots of cabinets, pantry, nook, bill desk & nook looking out to patio. Master w/ fireplace downstairs! Walkin plus second closet. Large master bath w/ 2 sinks,"
"Must see Leona Valley Pool/Spa home with excellent views!!! Move in ready! New carpet and paint upstairs. New septic tank. This home shows pride of ownership and gives a warm country feeling. Gorgeous custom front door, screen and frame. Step down living room, several dual pane windows gives plenty of natural light, brick fire place area, dining room has wood flooring, wood burning fire place w/ brick backsplash and French doors leading to backyard. Spacious kitchen with center Island & vegetabl"
"Country living. 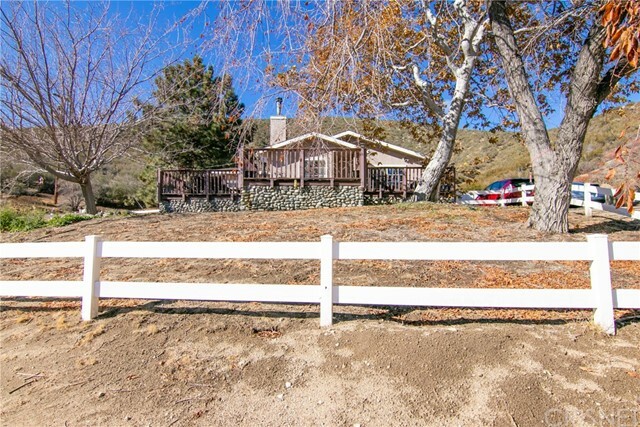 Nearly 2 acre horse property with a great deck to enjoy the view. The open concept kitchen features Corian counter tops and newer appliances." "Situated in Leona Valley resides a stunning single-story ranch styled home just waiting for the perfect buyers! 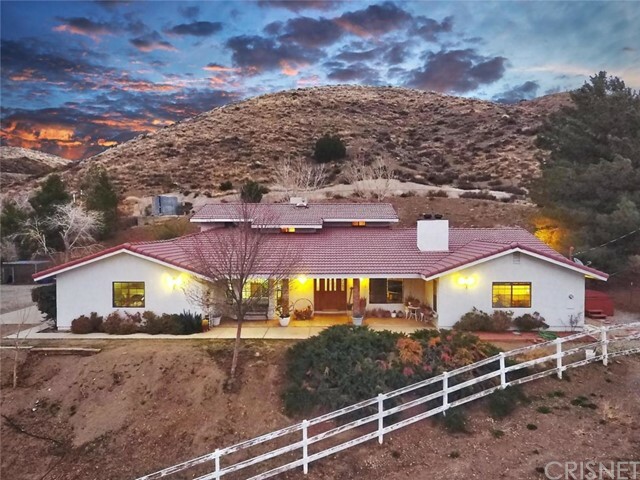 Nestled in Rolling Hills this hilltop home offers a little over 2.5 acres, with an incredible floor-plan of 2 bedrooms, plus a Bonus Room, 2 bathrooms and 1,619-SQFT of living space. Entertain or relax with guests in the well-illuminated living room, where you can unwind near the fireplace or to make your way through the double glass sliding doors so you can bask in the lush green hill"